Growing plants in pots on a balcony is even more difficult than having them on a veranda or in the back yard. Why? On the balcony there is very little else to catch the eye, so if the garden pots are not beautiful, or if the plants in them look jaded, it will be really noticeable and the pretty display you were aiming for simply won’t materialise. So the best pots for balconies are those that both look really attractive and have several other elements that help the plant to grow well. Pots with thicker walls offer a bit of insulation from the heat that many balconies suffer from. They are also heavier so can withstand winds that are often much more forceful on a high rise balcony than at ground level. However, they should not be too heavy as balconies usually have a maximum weight load owners must adhere to for safety. 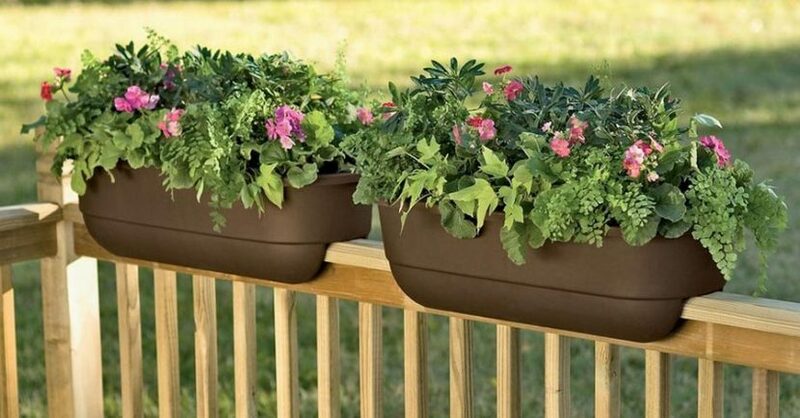 Pots for balconies should also have a saucer underneath or be designed so that excess water won’t run out the bottom and stain the cement on the balcony. Dirty water can drip off your balcony and fall or blow onto the one below. Not a good way to be friends with the neighbours. Pots should be chosen to suit the growth habits of the plant in them. If the plant is going to grow really tall, the pot needs to be larger and heavy enough to prevent the whole lot blowing over.